We are now giving schools an opportunity to experience the excellent Out of Africa School's Pack. Send us a note - click here - and we'll send you a copy to evaluate. The Out of Africa Campaign School's Pack has been designed for teachers, and is packed with activities that suitably link across many strands of the National Curriculum, at Key Stage 2 and 3. 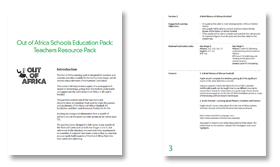 References to the statutory and non statutory requirements of a number of subjects, such as English, Geography, History and PSHE have been made so that aspects of the Out of Africa pack can be easily built into the curriculum planning. Each exhibition costs £47.50 £35.00 for the complete pack, or £22.50 for the Documentary DVD only (inclusive of postage), and can be with you within a few days of your order. Please make cheques payable to CENTRE SPOT and include contact details, in case a problem arises with the order. Email your request to info@outofafricacampaign.co.uk and you will be invoiced once the goods are sent to you. Please note payment by invoice is only available to organisations. The exhibition is suitable as an educational tool for libraries, schools, community and youth groups and workplace spaces.